Les Noces de jeanette : located in the 9th district, this restaurant have a wonderful wine cellar as well as rich and typical french cuisine. 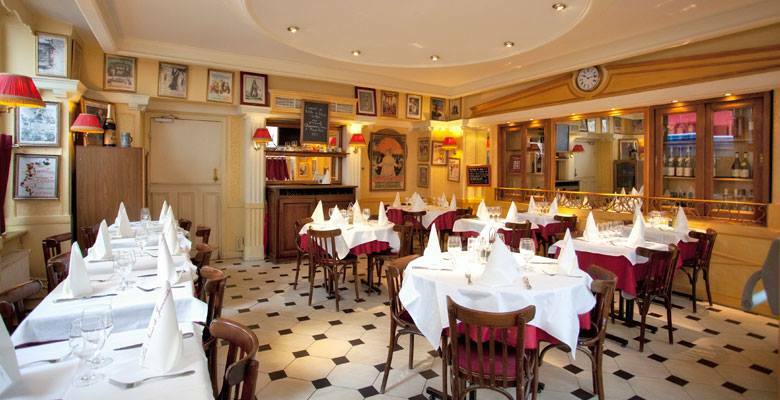 La Bonne Franquette: located in the heart of old Montmartre, and opened 4 centuries ago!, this restaurant in a simple but authentic decor have a « carte » with a lot of French delicatessen. It was the favorite place of many artists like Monet, Zola, Cézanne. There is also a painting from Van Gogh called « La guinguette ». Le 58, Eiffel Tower – Restaurant 58: located on the first floor of the Eiffel Tower, this restaurant is managed by one of Alain Ducasse’s favorite chef. With a great panorama of Paris, by day or by night, you will enjoy a nice meal, changing according to the chef desire! Ciel de Paris, Montparnasse Tower – Ciel de Paris: located on the top of Montparnasse Tower, it’s definitely one of the best view of the city. The restaurant has been conceived to offer to its customers a wonderful decor to sublimate the beauty of the city.